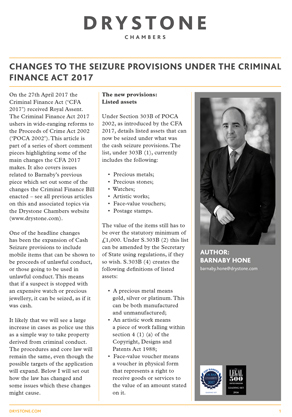 The following article is one of a series authored by Barnaby Hone where he explores new regulation and how best to interpret and utilise new provisions surrounding POCA confiscation, enforcement, asset forfeiture and related topics. Following his previous article on Section 10a POCA 2002 from a defence perspective, in the following article Barnaby explores the possible impact of the Criminal Finance Act 2017. In particular, the expansion of cash seizure provisions enabling prosecuting authorities to seize mobile items such as jewellery, artwork, or precious metals and stones. Barnaby provides clarity upon precisely what kind of assets prosecuting authorities can now seize and how they can seize, even if the item is proved to only be part-recoverable and impractical to divide into recoverable and non-recoverable parts.